This entry was posted in Home Security and tagged Home Security Lighting, Home Security Tips, Rental Home Security, Theft Prevention on June 21, 2017 by Locksmith Sarasota. Renting out a property can be a great way to supplement your income and start seeing a return on your investment. The decision to become a landlord, however, should not be made without serious consideration. One wrong move could not only impact your rental property, but the rest of your financial portfolio as well. 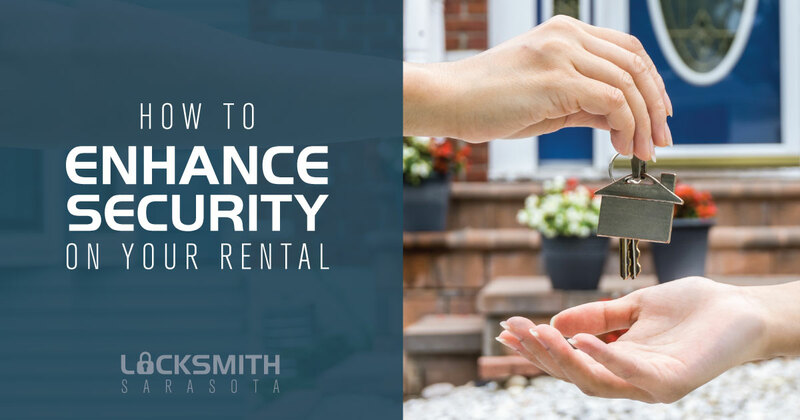 When it comes to rental home security, ensuring the safety of your property is a major challenge. It’s essential that you explore your options and legal obligations, then prepare accordingly. Thankfully, there are several ways that you can ensure both the physical and financial security of any property you own. Physical vulnerabilities can quickly be addressed and should be the first priority. Once the word gets out that you’re renting an unoccupied property, it’s only a matter of time before unscrupulous individuals take notice. Strong doors and locks are a basic and necessary part of rental home security. Hollow wooden doors and doors with windows are easy enough for an intruder to overcome. Ideally, entrance doors should be constructed out of metal or solid wood without windows. Using a dual cylinder deadbolt lock prevents a would-be intruder from making a hole in the door or a nearby window and opening the lock from the inside. A dual cylinder lock is designed to require a key turn on both sides of the lock, as opposed to using a latch on the inside. Thieves and vandals prefer to do their dirty work in the dark. The presence of outside light around your property is a strong deterrent for anyone who might threaten your property. Choose long-lasting lights, such as LED lights, that require minimal maintenance. They should be installed on all sides of the property and activate automatically using a timer, light-activated sensors or motion sensors. Keeping the rental home safe from physical threats is challenging by itself. Ensuring legal and financial security adds new wrinkles to the problem, but this task is just as vital. 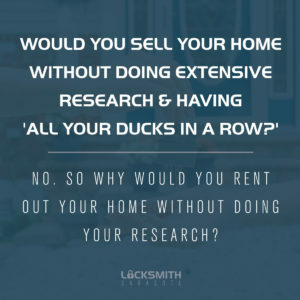 Remember that laws regarding rental property vary greatly from one place to another, and ignorance is not an excuse. If your rental agreement terms and conditions are unenforceable, for example, you may face serious legal and financial consequences. Do your research. If necessary, consult a local attorney who is familiar with the rights and responsibility of a landlord in the area. Whether you are renting your property to long-term tenants or accommodating short-term tenants, it is very important that all of your agreements and terms are in writing. A bit of paperwork will go a long way toward protecting your property if something goes wrong. One of the worst things that can happen as a landlord is that a tenant gets hurt, damages your property or damages your neighbor’s property. Despite your best intentions and precautions, you may still be sued. That’s why liability insurance is an important part of rental home security. Don’t underestimate how much protection you’ll need in terms of liability. The hard number will vary wildly based on your property, location and tenants. You may need more than the standard $1 million limit. There’s nothing more important than keeping your home and your family safe from harm. Need more tips on protecting your home from intruders? The pros at Locksmith Sarasota are happy to share industry knowledge and top safety strategies with homeowners. Explore our site for more expert advice about locksmith services.